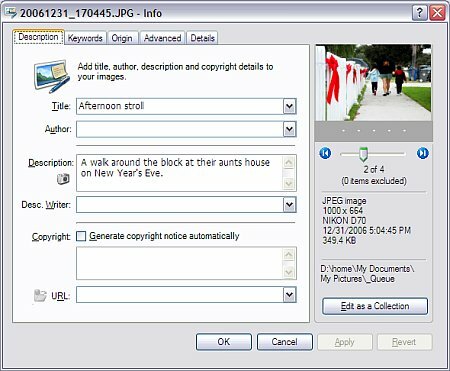 Microsoft Photo Info is a new, free downloadable software product from Microsoft that lets you easily and elegantly modify the metadata (IPTC and EXIF) about any of your digital photos. The download is for Windows XP and Vista only. Metadata includes details like when the photo was taken, where it was taken, the title, captions, description, keywords, and even a rating on a scale from one to five stars. It works great with Flickr. You can set your title, description, and keywords on the photo; upload it; and that data becomes the Flickr Title, Description, and Tags automatically. Another thoughtful feature is the ability to select multiple photos at once and edit them in a batch. You can either browse through them one by one using a thumbnail view or apply one set of changes to the entire batch at once. Very nice. Incidentally, any keywords you enter are stored in standard IPTC keyword fields. That means those keywords are compatible with Flickr, Picasa, and a ton of other photo organization applications. For example, I can add keywords using this tool and search on those keywords in Picasa.